In case of FTP and Email delivery, the customer has to provide the configuration of the whole system, providing all necessary parameters needed for the correct functioning and managing of the received data. The HTTP modality is instead developed for interacting with the DeepLog Portal service offered by Nethix, for providing a complete and functioning system, specifically developed for supporting DeepLog. The communication between the devices and the DeepLog Portal takes place through an encrypted protocol, that grants the highest security in the data transmission and the greatest flexibility in the data management. 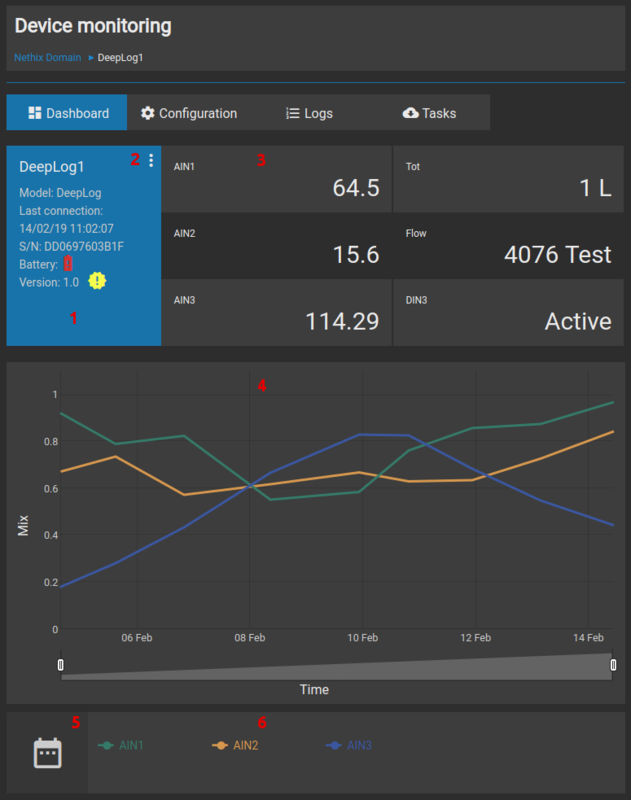 The Webinterface of DeepLog Portal is accessible from any device having an internet connection (Pc, laptop, smartphone or tablet) and provides a central collection point for the data coming from all the devices managed by the customer. The Customer is the client that interacts directly with Nethix and is the account’s owner. Every Customer has the possibility to manage one or more domains. The domain is a group of devices. The users are connected to a Customer and to Domains. If a customer wants to create sub-group containing its clients or the devices referred to a certain area or region, this cloud structure allows to create several domains. In every additional domain it can then be defined which users are enable. The header is the upper part of the web interface and remains the same on all the pages of the DeepLog Portal. On the right side are the icons that allow to change the language of the interface ( ), to contact Nethix Support for assistance ( ) and to enter the online documentation ( ). 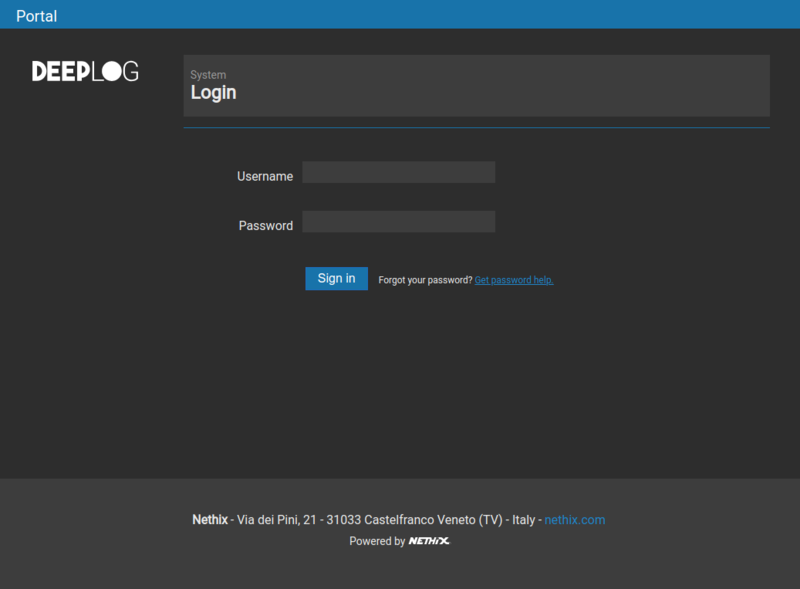 On the left is displayed the username of the logged user. Clicking on the Username it’s possible to logout and enter the Account page. Through the buttons Save and Back it’s possible to save the modifications or to get back to the previous screen, without saving the modifications made. The Menu displayed on the left side of the DeepLog Portal Web Interface allows the user to browse through all the pages of the portal. The Menu is divided into three sections, that correspond to the three different levels inside DeepLog Portal: domains, devices and users. Clicking on Domains the user has the possibility to display all domains, where he’s enabled. For the Admin User the whole list of available domains associated to the Customer will be displayed. 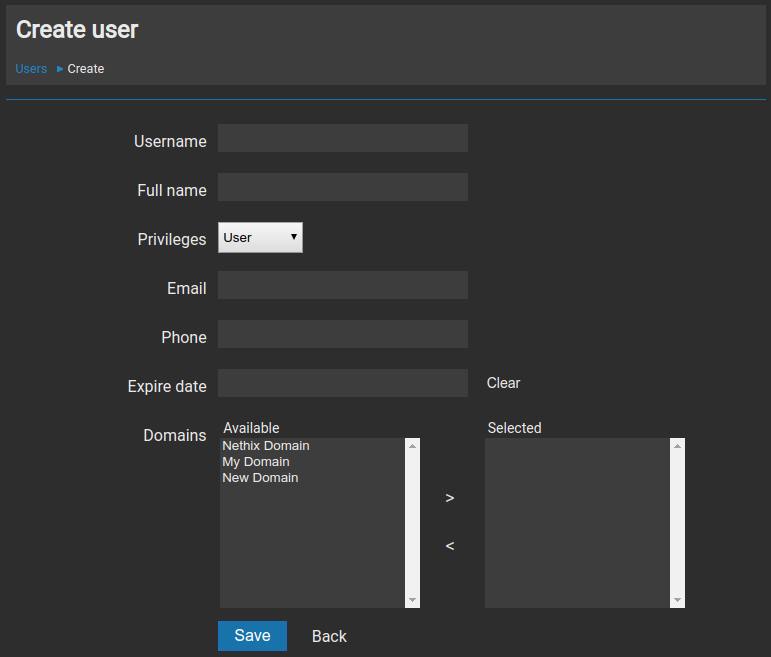 The Admin users can also modify or cancel the available domains or create new ones. Selecting one domain from the list, all devices included in that domain will be displayed. The section Devices on the Menu allows to display the List of devices, registered in the Portal. 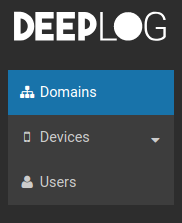 The Admin users can access all registered Deeplog devices, and also the page Registered Devices, in order to see the whole list (independently from their specific domain). The Users section of the Menu ( available only for user type Admin) provides the access to the list of enabled users. The Admin users have the possibility of adding, canceling or modifying users of the types User and Monitoring. Further possible Admin users will be included in the list, but it’s permitted only the visualize their name and email address, without having the possibility of modifying them. On the body of the Web Interface of the DeepLog Portal are displayed the information and specific options of the page selected from the menu. Even if the content may change according to the selected page, the structure of the central body shows mainly three elements: the upper part, where the name of the current page is reported; the central part, where the lists of domains, devices and users are displayed and the lower part, where the keys for saving, deleting and editing are available (if allowed by the privileges of the user). The footer is the closing element of every Web page of the DeepLog Portal. 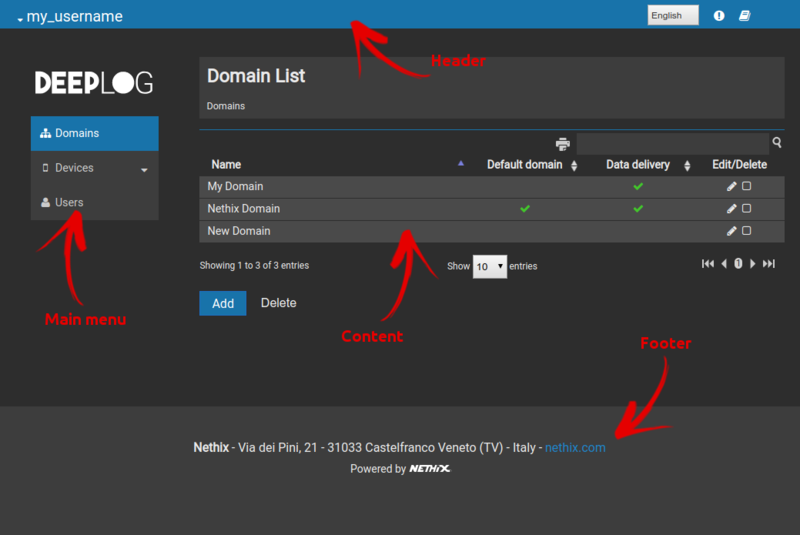 On the footer are displayed the basic information about Nethix (address and Web site). This part cannot be changed or edited, except if on specific request by the customer. After the Log-in inside the DeepLog Portal, the first page displayed is the Domain List. The Domains can be considered as “containers” of devices and allow the Admin users to organize their several DeepLog. The Admin users can in fact visualize and manage all the devices associated with their Customer (i.e. the person or company that has subscribed the contract with Nethix for using the Portal): they can decide whether to create users with limited privileges and enable them only to a part of the available domains. The User Users or Monitoring Users will therefore have access only to some of the available DeepLog. 4 If the green check is available on the column Data Delivery, the devices associated with that domain are enabled for data delivery to the DeepLog Portal. 5 The column Edit/Delete is available only for the Admin Users. If permitted by the user’s privileges, it’s possible to click on Add to create a new domain. Clicking on Save, all modifications will be confirmed; clicking on Back, all modifications will be erased, returning on the previous page. Once created a domain, it’s possible to select it from the list of available domains and add one or more devices inside of it. On the first case all the DeepLog enabled for the user are displayed, independently from their domain. On the second case only the devices, associated with the selected domain, are shown. Version It shows the software version currently installed on the device. Beside the version, the following icons may appear: means that new upgrades are available, means that an upgrade is in progress. Connectivity This field appears only in case of Networking events (as described below). The icon indicates the occurrence of a critical condition (for example if a Deeplog couldn’t make the data delivery within the defined time), while the icon indicates that there are no connectivity issues between the device and the DeepLog Portal. 2 In this area is displayed the last acquired status of the selected device inputs. The values displayed correspond to those of the last data delivery of Deeplog. 3 The icon allows to edit or cancel the selected Deeplog. In edit mode, the Admin users can change the name of the device and the domain, and can enable/disable the data delivery. Once entered the required information, it’s possible to confirm, clicking on Save, or to erase, clicking on Back. Clicking on the name of a DeepLog, available on the list, it’s possible to enter the section, where the collected data are displayed. Here it’s also possible to configure some additional functions. The first section displayed refers to the Dashboard. Version It shows the software version currently installed on the device. Beside the version, the following icons may appear: it means that new upgrades are available, it means that an upgrade is in progress. 2 The icon allows to edit or cancel the selected Deeplog. 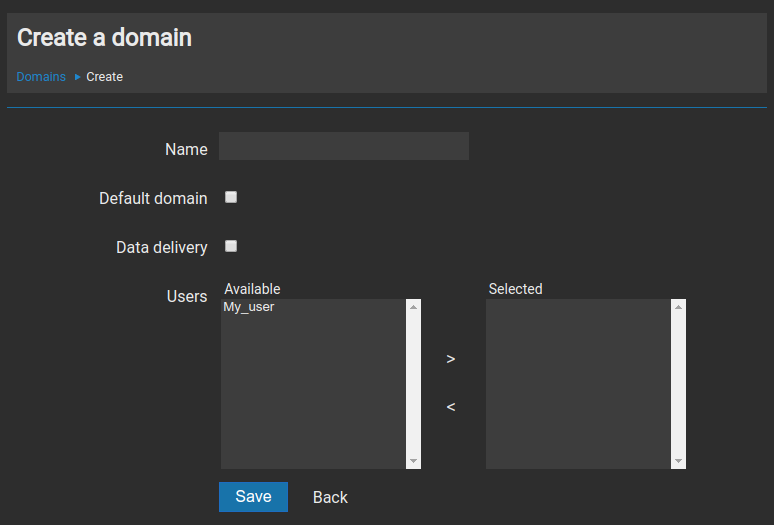 In edit mode, the Admin users can change the name of the device and the domain, and can enable/disable the data delivery. 3 In this area the last acquired status of the selected device inputs is displayed. The values shown correspond to those of the last data delivery of Deeplog. 5 Clicking on the icon it’s possible to select the time interval to be applied to the chart. Clicking on Networking, it’s displayed the area that allows to configure some of the main parameters useful for the proper functioning of the SIM data connection. APN The APN (Access Point Name) is an important option, to be configured for a proper functioning of the data connection. The value of this parameter may vary according to the Provider of the Sim card inserted in the device. For further information contact the Provider or visit its web site. Clicking on Data Sampling, the section is entered, where the interval of time for the execution of the data sampling on the connected sensors is set. It’s also possible to enter a value on the field Sensor startup time (seconds): this parameter defines, how long DeepLog should supply any active sensors (i.e. those sensors that require an external power supply). The programmed frequency of DeepLog wakeups and the duration of sensors startups (beside the current consumption of the same) may influence the battery lifetime. Once defined the data sampling time in the internal memory of the device, it’s possible to select the option Data delivery, in order to define the interval of time and the recipient of DeepLog data delivery. The first parameter to be entered is the Data delivery time. This parameter is unique for any type of delivery and is strictly connected with the sampling time described above. It’s in fact possible to program DeepLog with two different intervals of times for data sampling and data delivery. For example, if we set a sampling time of one hour and a delivery time of 24 hours, DeepLog would be started up 24 times a day, but establish the data connection only once a day. The frequency of the required data delivery of DeepLog influences the number of data connections and thus the battery lifetime. There are three different data delivery methods, and they can be enabled simultaneously: HTTPS, FTP and Email. The HTTPS method allows DeepLog to send data to DeepLog Portal. For a proper functioning of the system, keep the default parameters unchanged. For this data delivery method, the customer must start up his own FTP server. In this case the data are delivered in .csv format, in order to be easily processed. Even for the Email data delivery, the customer has to provide the management of the delivered data. Also in this case the used format is the .csv..
DeepLog is equipped with 3 analog inputs, each of them is configurable according to the specific requirements of the installation and of the sensors. For the configuration of the analog inputs, click the option Analog input 1..3. Once filled in all previous fields, it’s possible to click the tab New Event in order to enter the section dedicated to the event creation. To create an event it’s necessary to define a condition that, once occurred, lets DeepLog Portal send an email to one or more recipients: for instance at the crossing of a threshold by one of the monitored sensors. Recipient Enter a valid address of the recipient of the email. Through the icon it can be added further recipients. To remove a recipient from the list, click on the icon available on the right top corner. The email will be sent when the value of the Analog Input 1 is higher than 5. 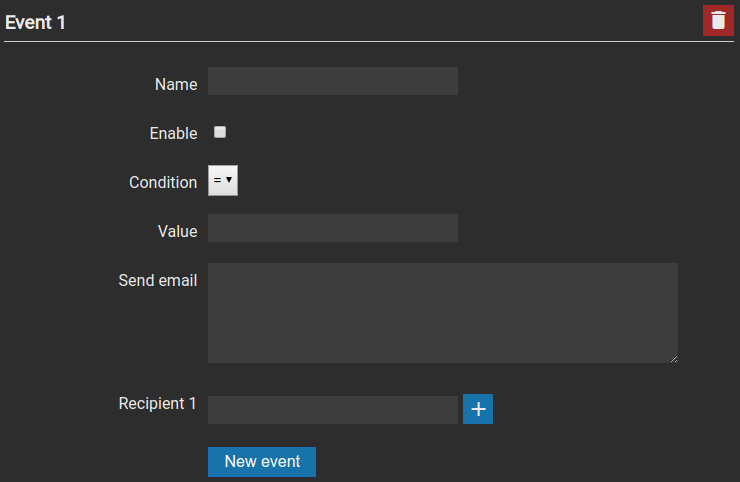 After the configuration of an event, it’s possible to create a new one, clicking on New Event. To cancel a previously created event, click on the icon . DeepLog is equipped with 3 digital inputs, each of them configurable according to the specific requirements of the installation and of the sensors to be read. To configure the digital inputs click on the option Digital Inputs 1,,3. Type It’s possible to choose the desired digital input type. According to the selection, the following fields may have different meaning. The available options are: Normal, Totalizer, Flowmeter and Power output. Selecting this option, the input will be used as a totalizer. At each received impulse, the value of the totalizer will increase of the quantity specified by the user. DeepLog can read the impulse received on a digital input configured as a Totalizer, even if it’s on energy saving status. Totalizer option is available only for the digital inputs 1 and 2. Selecting this option the input will be used as a flowmeter. The sample unit set by the user will be then divide for the time calculated between two impulses. Volume It’s the sample unit to be divided for the time passed between two impulses. Decimals It allows to specify the number of decimals to be displayed. Even if in energy saving status, DeepLog counts the number of received impulses. Every 30 minutes the device wakes up and save in the internal memory the number of impulses received. Then it resets the counter and starts counting again. 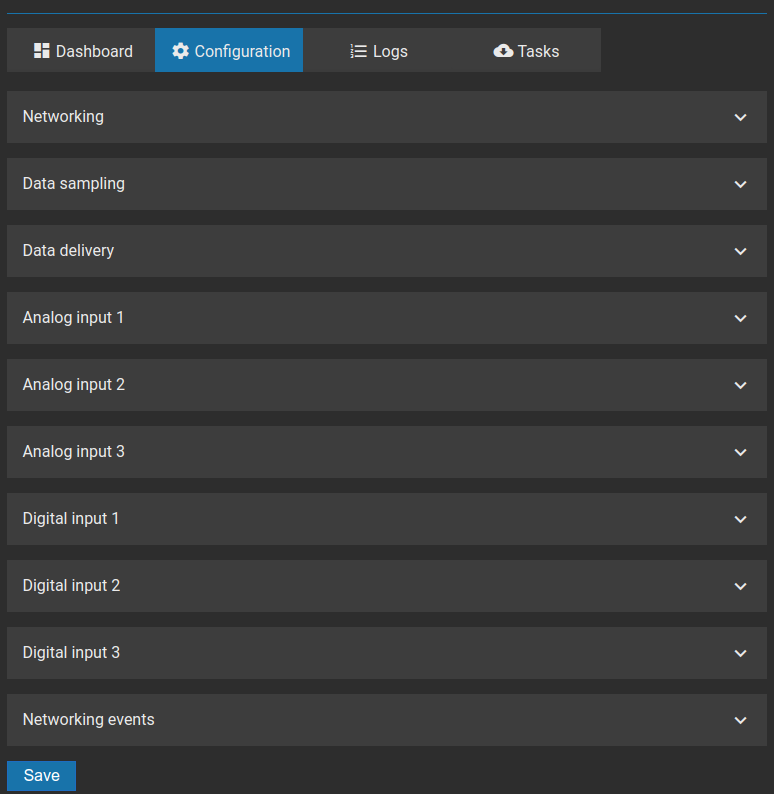 Every hour it sends two types of data to the DeepLog Portal: each of them includes the result of 30 minutes sampling. 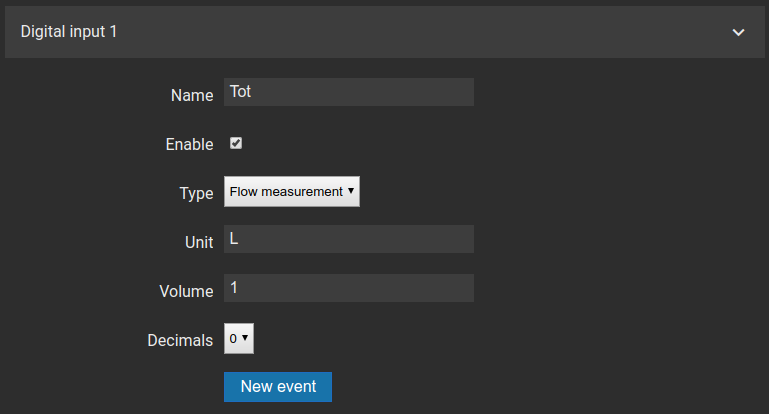 DeepLog Portal calculates the flow, multiplying the volume by the number of impulses and dividing the result for the sampling time. DeepLog can read the impulses received on a digital input, configured as Flowmeter, even if it’s in energy saving modality. Flowmeter option is available only for the digital inputs 1 and 2. Selecting this option the input will be used for powering active sensors, that require an external power supply. The so configured digital input cannot be used for reading impulse. The status of the input will be described as OK if no anomalies are detected and as Overcurrent if the device detects a current request higher than the max. allowed. Independently from the selection made on the field Type, once filled in the specific parameters, it’s possible to click on New Event, and visualize the area dedicated to the event creation. The creation of a new event allows to define a condition that, at its occurrence, lets DeepLog Portal send an email to one or more recipients, for instance, at the crossing of a certain alarm threshold by one of the monitored sensors. Condition Specify the condition that shall occur for triggering the email to the recipients. The available conditions are: equal to, different from, lower than, lower or equal to, higher than, higher or equal to. 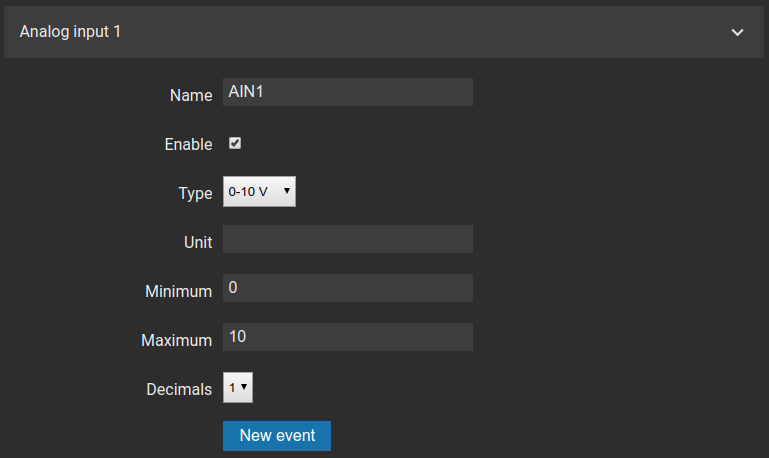 After the configuration of an event, it’s possible to create a new one clicking on New Event. To cancel a previously created event, click on the icon . 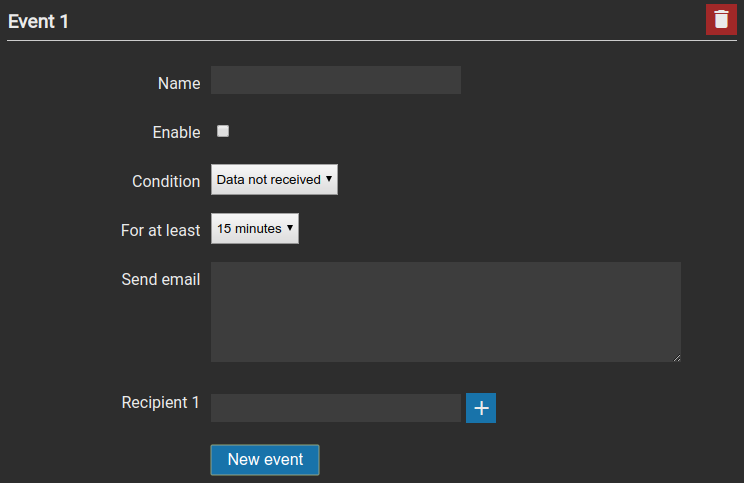 Selecting the option Networking events from the page Configuration, it’s possible to add events, in order to send email notifications in case of malfunctions: for example if a DeepLog misses the scheduled data delivery. After the configuration of an event, it’s possible to create a new one, clicking on New Event. To cancel a previously created event click the icon . 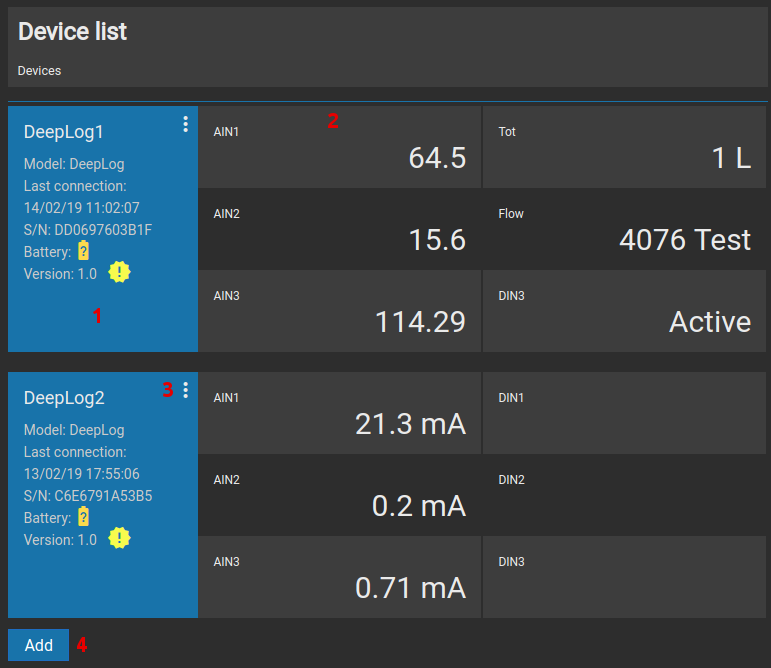 Selecting one DeepLog from the list of available devices, it’s possible to display the chart of the collected data on the page Dashboard. Selecting the page Log, it’s possible to visualize the data on tabular format. 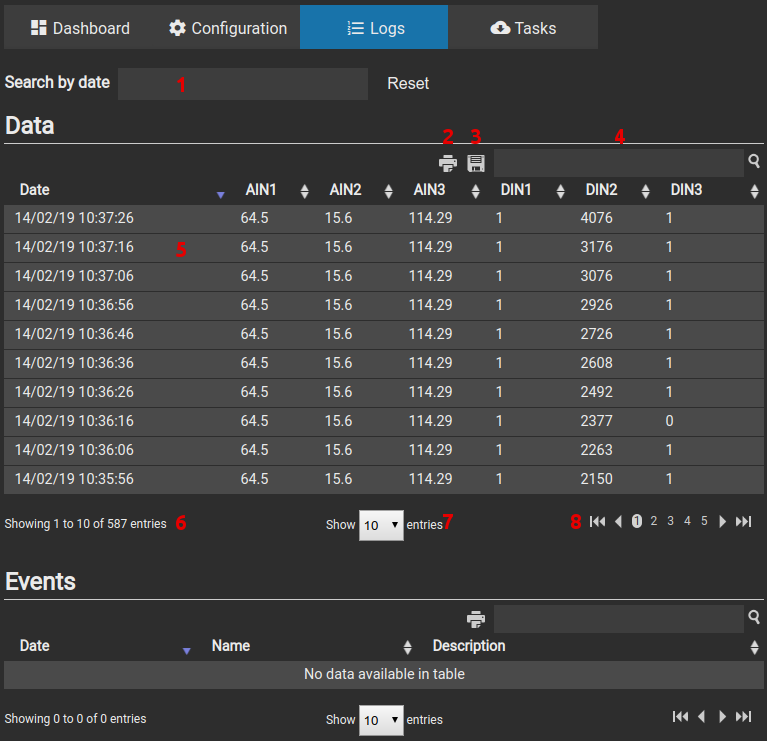 The Log section is divided into two areas: the upper part (called Data) reports all data referred to the analog and digital inputs, while the lower part (called Events) shows the complete list of occurred events ( both referred to threshold crossing and to connectivity issues). The displayed data on this page are not the raw data collected by the device, but are already scaled according to the settings made by the user. The Tasks are upgrading actions requested by the user and can be classified into two groups: Firmware upgrade and Configuration upgrade. Anytime the user makes a modification on the device configuration ( see Device Configuration), and anytime that a Firmware Upgrade procedure is launched, a Task is created. This task will be performed at the first connection of DeepLog to the Portal (for instance at data delivery). The list of the performed, outstanding or failed tasks is available on the section Tasks. 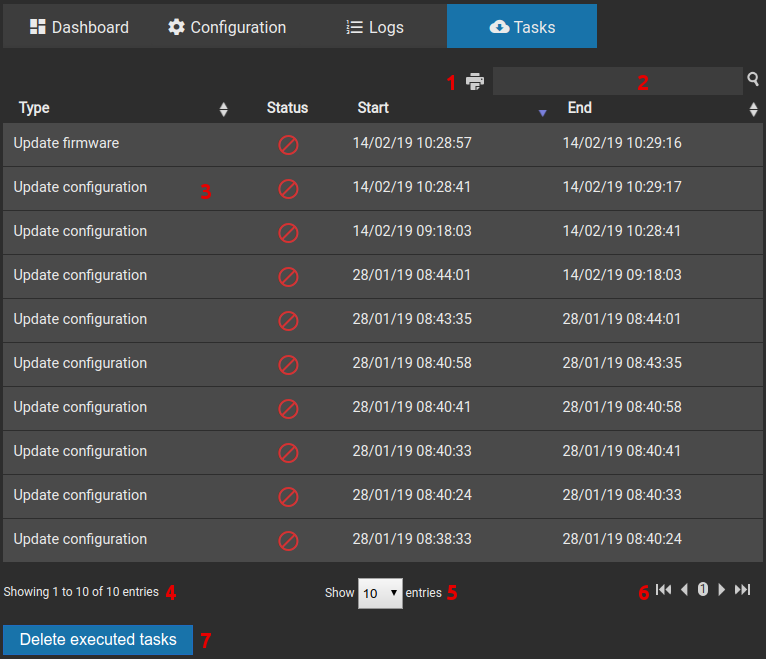 DeepLog Portal allows to remotely upgrade the managed devices. The availability of a new upgrade is notified through a dedicated icon, available on the summary box of each Deeplog (both from the Device List and from the Dashboard). Clicking on the icon it’s possible to start up the upgrade procedure. It’s then required to confirm the operation, clicking on the button Update or to quit clicking on Return. 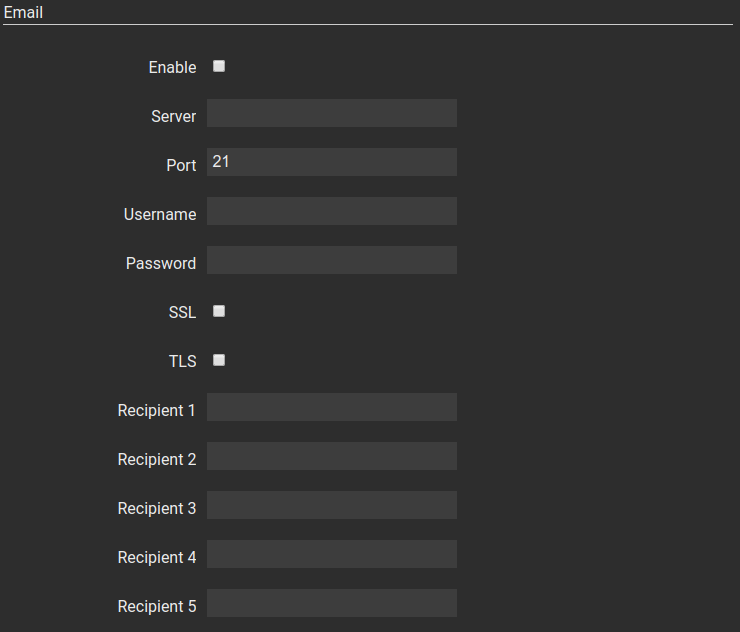 Admin This type can manage all DeepLog and all available Domains. It can create users of type User and Monitoring, but cannot create, visualize or change other Admin users. User This type can be created by an Admin user and can create Monitoring users. 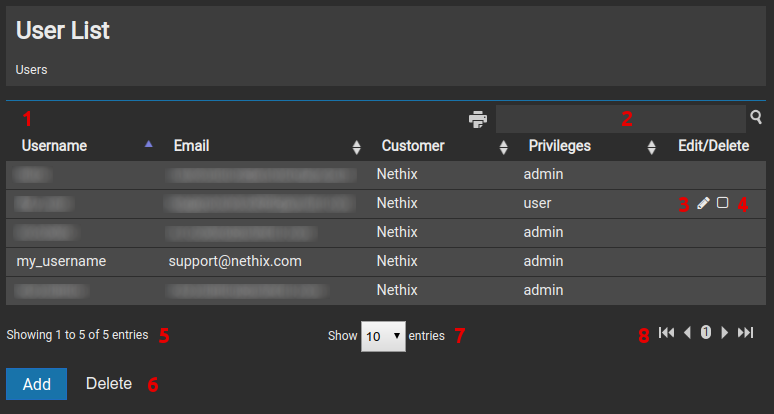 It can manage domains, if enabled by the Admin user, and all devices associated to the same. Monitoring This type of user cannot create new users. Once logged in, it can visualize the data and the status of the devices available inside the domains, where it is enabled. Differently from the User user, this cannot make any kind of modification. Privileges Privileges to be assigned to the new user. It’s possible to choose among User and Monitoring. 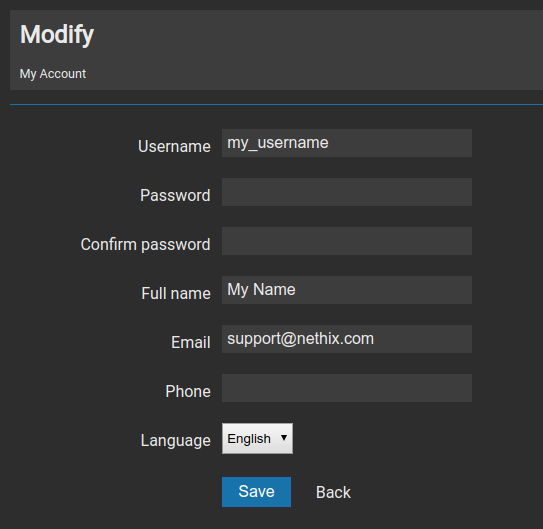 The Admin users can be created only on request of Nethix. Domains Selecting among the domains available on the left box and dragging them on the section Selected, it can be defined, in which domains the user is enabled. Clicking on Save, all modifications will be saved; clicking on Back it’s possible to go back to the previous section.